Earning money with electric power? Earning lots of money with electric power? A very good idea!!! Should I use coal or oil to generate power in the old-fashioned way or will there be a shortage of those resources in the future? Will there be a future in burning garbage? Certainly nuclear power is very exciting and as long as the government will manage the nuclear waste there will be a lot of profit. Of course, you can use more ecological friendly power and be independent of resources. But will such power plants be powerful enough for the customers in the future? Naturally, you must watch your competitors to see what plants they build, which cities they have in their net, what resources they depend on, and what new power plants they find interesting. This game is really simple in that each player has an energy company with the aim of becoming the first player to power enough pre-determined cities. In order to do this you first obtain various power stations of differing energy sources such as coal, oil, uranium, garbage, then buy the necessary resource from the stock market and then place your respective markers on a city, paying a cost to link up from one location to the other. The map has differing costs for certain links, with the idea that the shorter the distance, the less you have to pay. The number of cities you are able to power determines the amount of money you receive at the end of the turn. For some people you may now be thinking this is a little staid for my taste or a little dry! Well stay with me please because this is a game where you need to use your little grey cells. Each Player must bid for Power Stations and here you can get the chance to foil or mess up someone's chances - you could force someone to pay much more than they had planned to, but at the same time you could end up purchasing one that you really had no great interest in buying. Choosing what station to bid on is crucial. In the energy resource stage, you can hike the price of a resource needed by a competitor by buying in bulk, and in the connections stage, you can block them off from making connections, forcing them to pursue an alternative. What makes this game work is determining who goes first on each stage, this is always allocated to the person with the least amount of cities powered, thus giving them the chance to play catchup. This is an interesting game as like I said earlier it needs people to use their grey cells - you need to think do I link city and power them up thus not being 1st player, do I not link cities and have the 1st player opportunity, do I buy resource in bulk spending money on the basis that it messes a components game up! Do I attempt to feign interest in a power station in order to get someone to buy over the odds and spend all their money. (not that I would do that obviously). Just a note if you like interesting and colourful boards then this may not be for you its a little dull but I don't personally mind as the game makes up for it and when you consider that in the box there are two maps this is definately value for money!! A little mathy, logical, strategic - very fun game definately recomend this to anyone. This is quite an addictive game. I am a geologist/scientist type and I have found this game amazing. The wife and I have played it and a significant variability in approaches can make each game very different. The materials in the pack (board, pieces etc.) are excellent quality and certainly make the game play very enjoyable. The game play itself may seem initially complicated but a trial-run game alongside the instructions make it very clear and (as with anything) once you get into the routine then you are well away. I haven\\\'t had any expansion packs - yet, but I will. This is an amazing game and I am hungry for much, much more. Game time c. 2hrs is about spot on. The components of this game are extremely well made, the artwork is superb and well suited to the theme as well as a large amount of very nice wooden pieces. The aim is to build a network of connected cities and to be able to supply them with power the person who can power the most cities at the end of the game is the winner. Each turn the players auction power plants to add to their network, then buy raw materials, build cities and finally power those cities to earn money. There is a lot going on on this game with plenty of player interaction and it is extremely enjoyable to play. The game scales well to different numbers of players. A real "thinker", though the decisions come in lots of small chunks. Like Age of Steam, there's plenty going on to think about, but it's thankfully a wee bit less cut-throat and desperate...maybe not by a lot, though. With so many decisions to make, it can get a bit analytical and mathematical - but there is very little time waiting for your turn. I found Steps 1 and 2 fun, but step 3 can end very quickly and sometimes too soon. The whole game can move from middle to end very quickly, leaving you feeling slightly anti-climactic if you haven't anticipated it with careful plays. After a few plays, I can see that it's a great game with lots of variation - not least of which is the fact that the board can be played on two different sides (USA and Germany). I like the artwork too, and the it's got a more meaningful theme than many Euros. And why not bag the varaint board - Italy and France whilst it's still around. A power-house of a game, (forgive the pun!). Auctions, resource management, territory control, great components, tough decisions. Just the sort of game I like, and reminds me why I like gaming so much. The game comes with a double-sided board, offering Germany and USA, which makes for two very different games. The strategies can be complex, but despite this, the game is easily learnt. 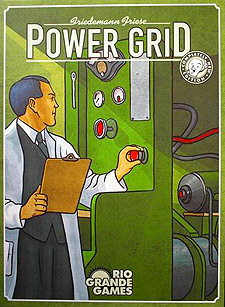 Players begin by buying power plants in an auction, which then have to be provided with fuel to power them. Then you begin to build up a network of connected cities which have to be supplied with power. The more cities that you add to your network, the bigger the power stations you have to buy, but you can only have a maximum of three, so have to 'upgrade' constantly, but this costs more money in the auction. Eventually, the player who connects 17 cities with power ends the game, but it is the player who supplies the most power (not necessarily the same player) who will win. A reccomended game just as playable with 2 as with more. Played this down the pub the other night and I think it is a great game, although I would not say it is the sort of game I would play down a pub. The main reason for this is that firstly the board is a bit big for your average pub table. Secondly with it being a resorce management game that takes lot of maths and thinking you need to be sober and not have too many distractions to get a good game. The game itself is great and I believe very good value because you do not get just one board but two and also the two boards are very different. I have yet to try out the one that looks like North America but it seems that it would make a very different game. The other nice thing about the game is that as was shown by the game we played, even if one player seems to be way out ahead that player can easily be caught by some strategic thinking and careful planning. Overall this is a very good game that I would recommend to anyone looking for a game with real depth and replay ability.